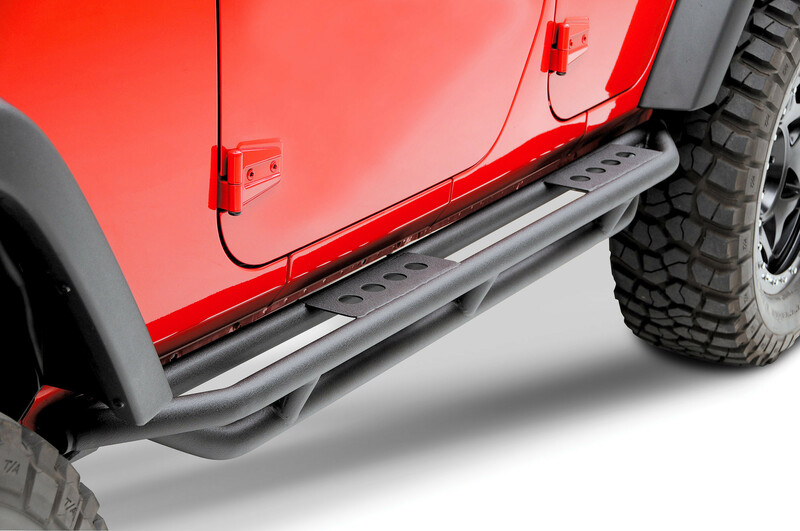 Just Jeeps SmittyBilt (Textured Black) Smittybilt SRC Side Armor Steps For 2007-18 Jeep Wrangler JK Unlimited 4 Door Models | Jeep Parts Store in Toronto, Canada. For the off-road enthusiast seeking to customize their Jeep for extreme toughness in rugged terrain, Smittybilt SRC Side Armor from Smittybilt offers the heavy duty protection you need. A durable 2" x 0.120" wall and powder coat painted steel comprise the rugged one-piece design, fully welded for extra toughness. SRC Side Armors also sport a dual "girder" system, providing additional underside protection on off-road terrain.